Im March 2018, I received this from Paul Plumley who is ex-RN and a fellow Bristolian. We were allowed one short weekend leave at what could be described as half term in the normal school year. I had just left the train at Temple Meads station and had decided to take a taxi to my home in Kingswood. What a Boy Seaman was doing with a taxi I don't know but perhaps it was one of my mother's weekend postal orders that made it possible. Our weekly three shillings and sixpence wouldn't have been enough I'm sure. The taxi driver told me to sit up front with him and en route told me that he had served in the prewar Navy. He described how, when he was serving in the Mediterranean in a large cruiser of the time, HMS Tiger, they had called into Gibraltar to coal ship. I have looked up Tigers history and she did indeed use coal and some fuel oil. This would have been somewhere around 1923. During 'coal ship' it was customary to call both watches and all the people who would normally be working below decks, so no one was excused. A gangway was put out at the bows and another one at the stern. On the jetty there was a line of trucks, perhaps they were dockyard railway wagons, all laden with coal. Each sailor was issued with a large pannier type basket made of some straw material. Then everyone filed down the forward gangway, trotted past the wagons, and I do mean trotted. Men in the wagons shovelled the basket on the shoulder of the sailor full of coal and the sailor doubled away to the after gangway and up into the ship. The ship's company being divided into two watches, that is port and starboard, the port watch went to the open coal hatches on the port side of the ship and the starboard watch to the other side. The basket was tipped into the hatch and stokers down below spread the coal evenly. The sailor then doubled away down the forward gangway to repeat the whole process again. So, several hundred men were employed in this task which had to be completed as quickly as possible. Every ship carries an inclinometer which is a brass pendulum, highly polished of course, suspended over an arc marked in degrees. An officer, probably a midshipman, was posted to stand in front of this inclinometer and wait for the ships angle to change. The first watch, port or starboard, to effect a change of 1° would have won. Their reward was an extra days shore leave at the expense of the losing watch. The sailors wore the Mediterranean working suit of the time, which was white! Coupled with coal dust in the hair and on the skin it must have been a nightmare to get everything clean again and of course the priority would have been the upper deck being restored to its customary pristine condition. Am I glad that by the time I joined all ships used oil fired machinery. HMS Armada (D14) was a Battle-class destroyer. HMS Armada in 1951. Photo from dad's photo albums. 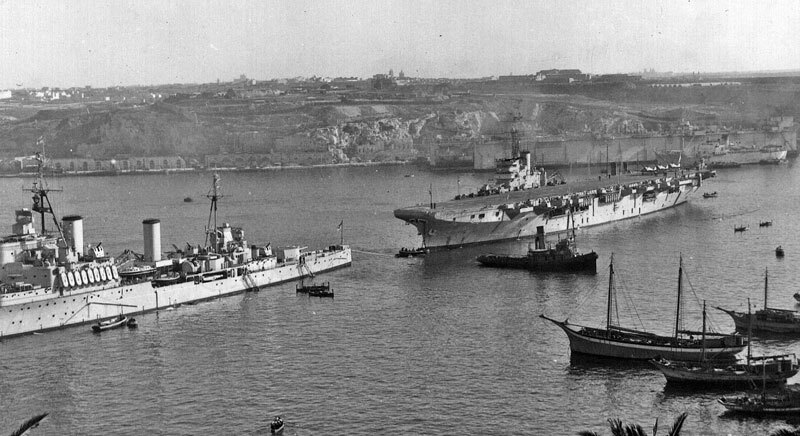 HMS Bermuda and HMS Warrior entering Grand Harbour, Valletta, Malta in 1953. Photo from dad's photo albums. 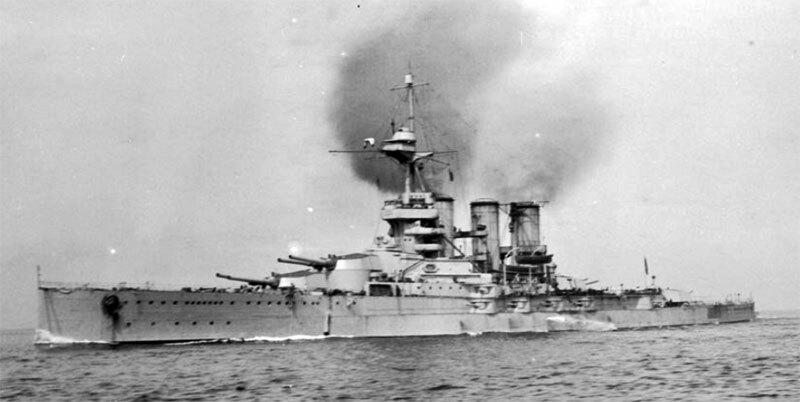 HMS Bermuda was a Crown Colony-class cruiser. 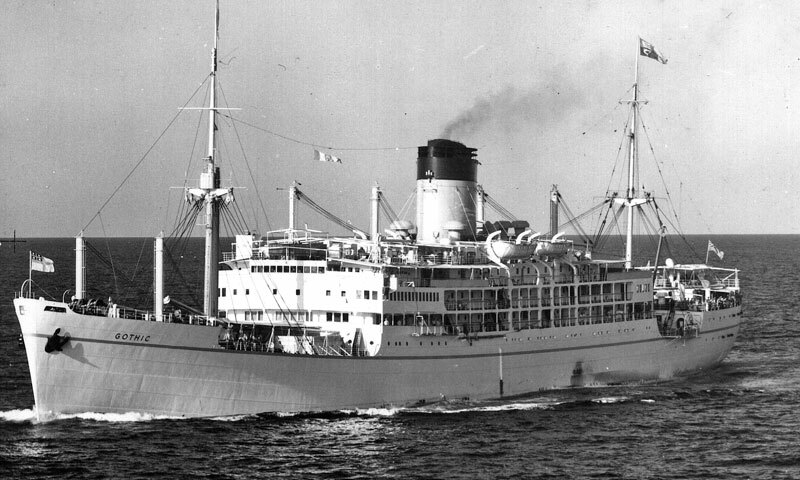 Dad served on HMS Gambia, her sister ship, from 1950 to 1952. HMS Warrior was a Colossus-class aircraft carrier and dad served on her from 1953 to 1955. HMS Birmingham, Newfoundland & Warrior at Singapore in 1954. Photo from dad's photo albums. HMS Birmingham was a Town-class light cruiser, HMS Newfoundland was a Crown Colony-class cruiser and HMS Warrior was a Colossus-class aircraft carrier. Raising HMS Brceonshire, September 1950. Photo from dad's photo albums. At 7am on March 20, 1942, convoy MW10 consisting of HMS Breconshire, and SSs Clan Campbell, Pamapas and Talabot, all carrying cargoes of explosives, ammunition and kerosene, and escorted by HMS Carlisle and six destroyers left Alexandria bound for Malta. The convoy was attacked fromthe air starting at 9:30am on March 22.and again the next day. Pampas and Talabot made it into harbout safely. Breconshire was just eight miles fro mthe harnbour when she was hit and dtopped by a bomb at 9:20am. HMSs Carlisle and Penelope attempted to tow her but were unable to, so Beconshre was anchored about a mile outside of Marsaxlokk Harbour. SS Clan Campbell was the slowest o the ships and 50 miles away from Malta when she was bombed and sank at 10:30am. The tug Ancient managed to take Breconshire under tow on the night of March 24/25. 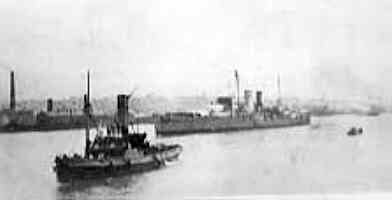 HMS Southwold hit a mine and sank and Breconshire was again bombed and also sank in 60ft of water. Part of HMS Breconshire's cargo was salvaged over the following months and in 1950 it was decided to salvage the ship. She was raised and towed, upsidedown, to Genoa to be broken up. In December 2001, I received an email from Mr. Des Johnson whose father-in-law was chief engineer on this ship during all its service including the time she was sunk. She was sunk on 27th March 1942 by a Stuka dive-bombing her, the bomb exploded in the engine room killing many of the crew. A raising attempt occurred in April 1954. "Reasons for my interest are that in the case of Breconshire, my father who passed away in August 1997, was the electrical engineer on RFA Sea Salvor which was assigned to take part in the salvage of the Breconshire. 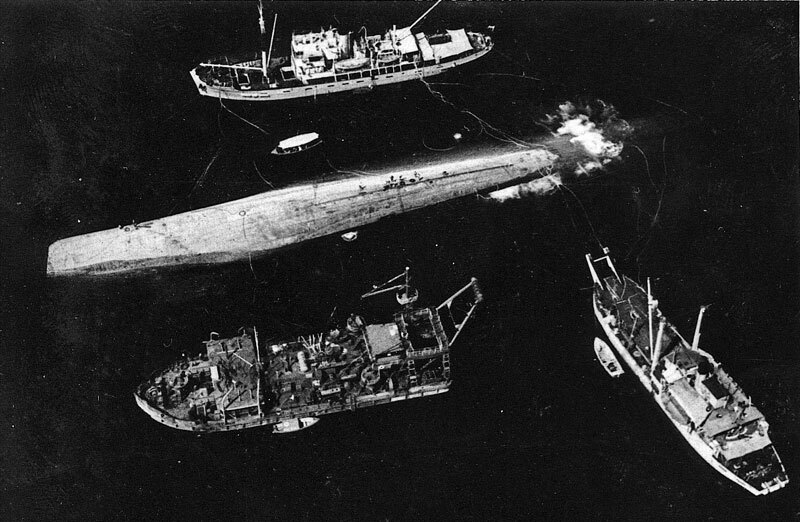 I am positive that the photo attached to your page in fact shows RFA Sea Salvor (top of picture) during that assignment. It is very evocative for me to think that my father was in fact in that photo when it was taken! I think one of the other two ships is the Barhill which was as far as I know, also assigned to the task. Interestingly, both these ships were also assigned to salvage the remains of FOG-ALYP - the COMET JET airliner which crashed off the coast of Elba and the salvage of which resulted in the solving of the mystery surrounding the numerous earlier Comet crashes. My father was also involved in that project for which with other crew members of RFA Sea Salvor, he received a commendation from Lord Mountbatten then Admiral of the British Fleet in the Mediterranean. 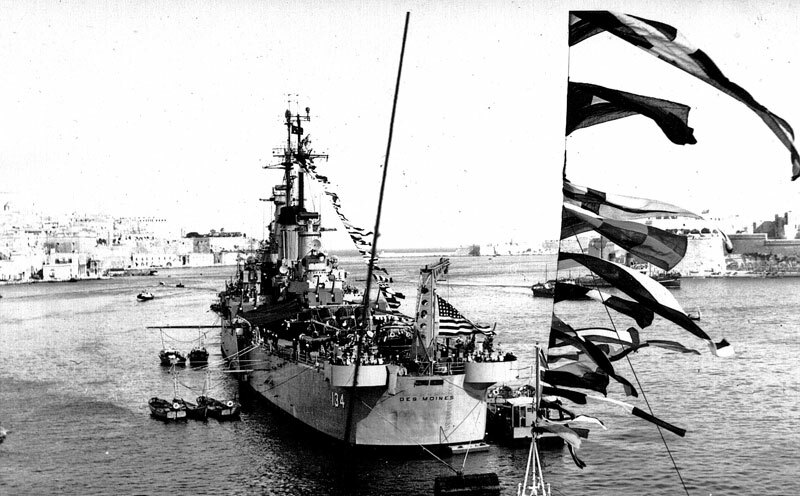 In the case of HMS Gambia, I recall as a young child in Senglea, Malta where I was born, admiring the many Royal Naval ships that were buoyed in the Grand Harbour in full view right in front of our house. The Gambia was a frequent visitor and with the many other British and international ships, was much admired. Given the visits to that port during the times you mentioned, I theoretically would have "seen" your father as I was certainly there during that period." In September 2012, I received another email from JLB who is now wondering about the date of April 1954 when the Breconshire was raised. I am a little puzzled as to whether I have been wrong for the last 50-plus years, in my belief that my father was in fact in Elba at that time, on Sea Salvor with Barhill, involved in the salvage of the Comet air plane - FOG-ALYP. I know ( at least I think I do ) this air plane salvage was begun some time in January 1954 or a little later and I am now wondering whether it was all over by April which would have to be the case, if Sea Salvor and Barhill were indeed at Marsa, in April 1954. We would be extremely grateful if anyone can confirm the dates of the of the salvage of FOG-ALYP and the Breconshire and any details of that ship, Sea Salvor and Barhill. 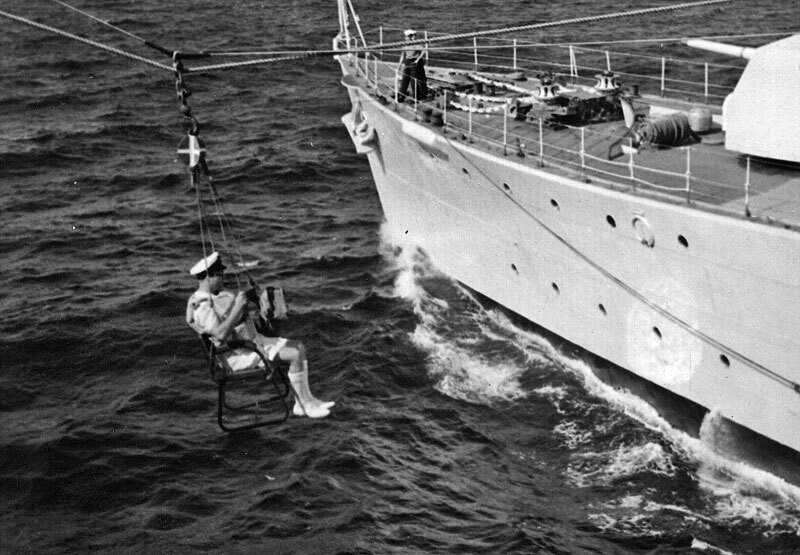 Captain (D) Med by Bos'ns Chair from HMS Chieftain to HMS Gambia ~ 1950. Photo from dad's photo albums. Fueling HMCS Crusader from HMS Warrior - 1953. Photo from dad's photo albums. 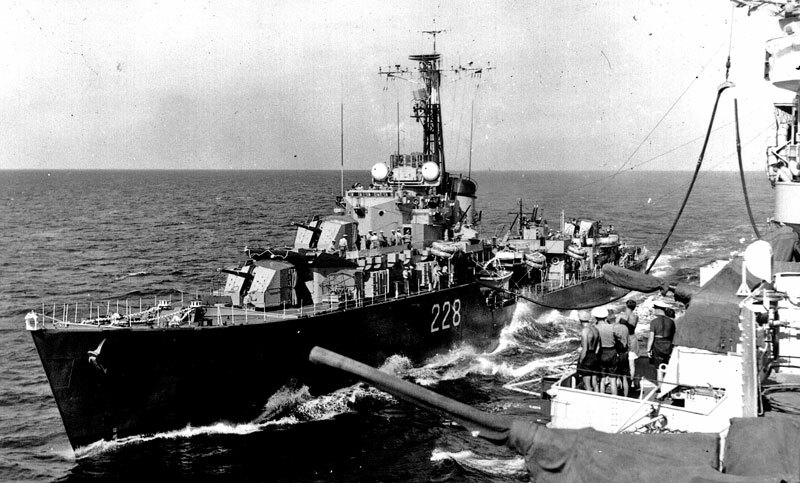 USS Des Moines in 1952. Photo from dad's photo albums. HMS Exeter after the Battle of the River Plate. Photo from Ray Holden. This picture was kindly sent to me by Ray Holden in January 2002, and shows the heavy cruiser HMS Exeter being taken into Devonport after the Battle of the River Plate. On the December 13, 1939, the Exeter, Ajax and Achilles put the German pocket battleship Graf Spee out of the war. One of Ray's relatives was aboard her at the time. Royal Yacht Gothic in 1953, carrying Her Majesty the Queen. Photo from dad's photo albums. HMS Glory at the Fleet Ships Regatta, Marmarice, Turkey, July 1950. Photo from my dad's albums.